For those of you who entered my giveaway and wondered "How'd she do that?" 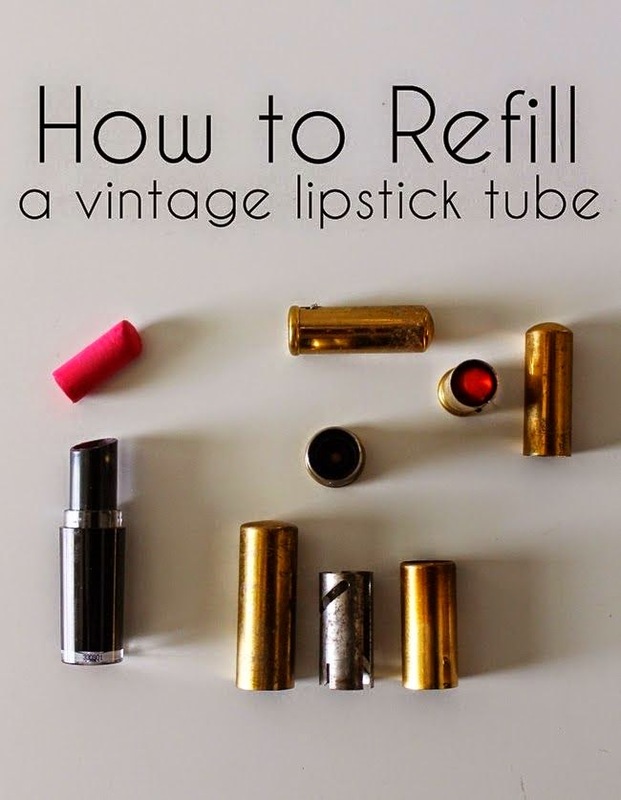 I'll share with you my secrets for refilling a vintage lipstick tube so you can do it too! You'll be surprised at how incredibly easy it is! 1.) Find a vintage lipstick tube. I have found them at antique shops, on ebay and etsy and auctions. You should be able to find one for between $5-$10. 2.) Take the container apart completely and soak in soapy hot water. Use q-tips, small tooth brushes or baby bottle brushes to thoroughly clean the tube inside and out. Make sure to remove any remaining lipstick and scrub off any grit on the inside of the tube. It is very important that each part is thoroughly cleaned because this case will be holding a lipstick that you will probably wear every day. Tubes that aren't cleaned and sanitized can be a breeding ground for bacteria, so be sure to clean each individual part very well. 3.) Rinse the pieces in rubbing alcohol, then rinse with warm water to sanitize. Reassemble the vintage tube and turn the bottom so the base is all the way at the top of the container. 4.) Find a lipstick that fits the tube. As long as it's a normal size tube, most modern lipsticks should fit. I tend to experiment first with a less expensive lipstick to get a good idea of how big the base should be. 5.) Here's the big trick...put the new lipstick in the freezer right next to your blueberries and veggie burgers for 2-3 hours. 6. )After lipstick is frozen, turn the base so the lipstick is all the way out of the tube. Using a piece of waxed paper, gently pull the lipstick from its base, wiggling it back and forth a bit until it comes out. 7. )Insert it into the base of the vintage container, putting a slight amount of pressure on the lipstick to push it onto the base. If the lipstick needs to be adjusted, continue to use the waxed paper so fingerprints aren't left on the lipstick. That's all there is to it, my lovelies! Have fun and ask any questions in the comments box below! BRILLIANT!! Do you mind if I post a this as a link to the Fedora Lounge - I know the ladies there will find this most useful. Inky- yes, feel free to share with others, and please add Tart Deco's tip about the lighter! Tart- that's a GREAT tip! Thank you for sharing! What a great tutorial; I have a few vintage lipstick tubes from my grandmother, so I will have to try this out! Thanks for that! I was looking out for lipstick tubes at an Antiques market the other day but came up empty handed sadly! Great tutorial. Just hope hubby doesn't think there is a new type of snack in the freezer. YOU ARE A LIFESAVER! I just bought a vintage 1950's stratton combined lipstick compact gold set, and I was desperate to figure out how to put in my lipstick. GENIOUS! no I can go to NYC fashion week, stay in the sherry and wip out my lipstick and feel beyond whimsically glamorous! You are amazing! Thanks soooo much! Bravo! I can finally use my vintage Revlon Jeweler's Lipstick cases (designed by Van Cleef & Arpels). So pretty; made to take out at the dinner table to freshen one's lips after a meal. GREAT! I'm going to try this out on my vintage 80's Body Collection Lipstick case, can't wait to try it! Our blog makes me smile! Thank you for figuring out this new lipstick in vintage tube trick. I just acquired some of the Revlon vintage colors (Cherries in the Snow!) but yikes! Lipstick in. Plastic tube... So after I read your tutorial I started hunting for vintage tubes, and oh... The Futurama tubes! They are beautiful but quite pricey and I am not sure if we can transfer new lipstick in them following your method. Have you tried? Hope You Stop By & Follow Back !!!! THANK YOU! I hate carrying around ugly cheap-looking modern packaging when I'm all vintaged-up. This is great! Great tip! But what if the sizes are different? how do you get the part of the tube that moves the lipstick up and down out? Thanks for your wonderful tips,now I know how to put my favorite ( but cheap!) lipstick into a wonderful case! I thought I was the only person who does this! I'm glad others do this! I also buy used Chanel and Dior etc and replace them with my fav cheap lipsticks as well as mid century Revlon and 1920s engraved sterling cases. I also have a few old Stratton loose powder compacts. I buy a drugstore brand powder compact, crunch out the powder from the pan while in a freezer bag. use a hammer to thoroughly crunch it into powder and place into the compact. Or just buy a box of loose powder from Amazon. My great grandmother taught me all kinds of hints to be comfortable on little money. She lived through the Great Depression. Hi. How on earth do I refill a vintage lipstick tube that's very tiny and shaped oddly. I have the La Mode compact with 2 narrow square shaped lipstick tubes on either end of the tiny compact; and pressed power and rouge compartments in the center.